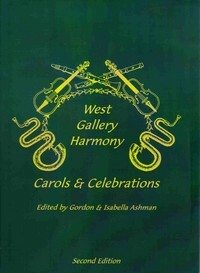 A collection of carols, hymns, psalms, folksongs and catches from the West Gallery tradition. "The music ranges from the late eighteenth century, through the peak period of west gallery singing activity and late Victorian "restorations" to the present day in the form of carols which are still sung in the Sheffield and Pennine areas. We also asked some of our friends to compose or set a small number of items in west gallery style ... We have also included a hauntingly beautiful air, which Cecil Sharp collected ..."
"Our initial objectives were to remain compatible with the first edition, to eliminate all page turns, to provide easy cross-reference to the first edition, and to enable wire-bound and transposed editions. To bring the first edition up to date, a free supplement will be available with material changes." 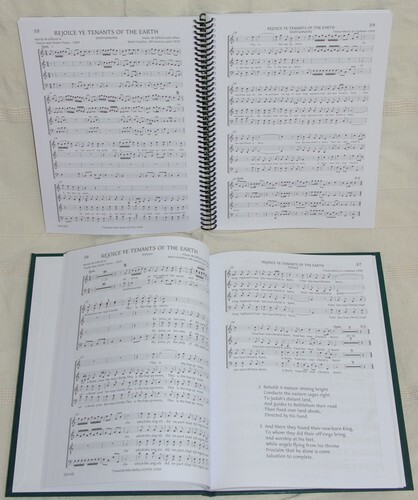 The book comes in two versions (with the same contents) - hard-back, which is more suitable to hold in the hand, and coil-bound which will lie flat on a music stand, but isn't stiff enough to hold conveniently. It has been specifically laid out to avoid page turns for instrumentalists and there is also a Bflat version. Members: £11 hard-back; £5 coil-bound, £5.50 Bflat wire-bound + postage. Non-members: £15, £6 and £7.50 respectively, + postage. Have a look at the companion volumes West Gallery Harmony - Psalms and Hymns aka "The Red Book" and Let Our Joys be Known aka "The Gold Book"